Michael Robotham is one of my favorite authors. These books engage you from the beginning and I find it difficult to put them down. The Wreckage is no different, filled with action and a complex story line. A late twist brings everything into focus. With all that said, I found The Wreckage to lack the suspense from some of the earlier novels. This is still a great book and very enjoyable. I love it and can't wait for [b:Say You're Sorry|13521564|Say You're Sorry|Michael Robotham|http://photo.goodreads.com/books/1340805869s/13521564.jpg|19082240] to hit US shelves! Firefox has some pretty nifty features. One of those is the ability to view the cache contents without any extra tools. This post covers an incident with a fake antivirus popup and how I used the built in Firefox tools to confirm my suspicions. The story goes, our daughter was using the computer and this appeared on the screen. My initial thought was this is a fake antivirus popup. 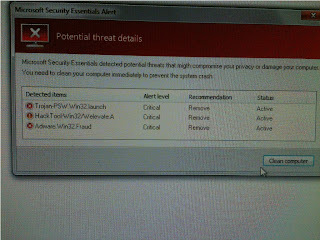 However, we do have Microsoft Security Essentials (MSE) on that computer and the screen shot is convincing. Following the old saying of "you are better safe than sorry"; I told her to shut down the computer and I would look at it when I got home. Once at home, I looked more closely at this incident. First, I opened MSE to review the logs and found that nothing was detected in any previous scans (edit: MSE actually calls this History). This starts to confirm the suspicion of a fake antivirus popup. The next step was to take the cache files from my daughter's profile and put them in a virtual machine. Since she uses Firefox, this is easy to do. If you are interested, explanations of the Firefox cache directories are here. A quick peek at the history reveals this is definitely fake antivirus related. The entries for detectionprotectorprocesses.in and "Viruses were found on your computer!" are dead giveaways. At this point you could stop but I will take a few more minutes to show you some of the Firefox cache exploration tools. I start the cache exploration by typing about:cache into the URL bar. This gives you the screen below which is not very useful. Clicking on "List Cache Entries" starts to look more interesting. This page can be searched by pressing Ctrl+F. I searched for "detectionprotectorprocesses.in". The fifth detectionprotectorprocesses.in entry refers to a PNG image file. Clicking on that link takes us to another page, specific to the alert.PNG cache entry. This page is filled with information. It includes HTTP server response headers and a full packet capture of the PNG image. In the center of the page is a line marked "file on disk". This gives the location on the disk where the cached image is located. I navigated to that location, copied the file to a temporary directory, and renamed it with a PNG extension. Opening this file removes any remaining doubt about the fake antivirus popup. This recovered image perfectly matches the text message I received earlier today! I suspect the popup came from the website directly prior in the browsing history, possibly from an advertisement. If that is true, it appears the problem has been remedied. I did look for some contact information on that website, but I did not locate any. I would have preferred to report this information, but I was unable to. Firefox is a great browser. These cache tools are great for troubleshooting and fun to explore with as well. I am certain Firefox includes many more tools that I don't know about. Hopefully you found something useful in this post. Thanks for reading! It turns out, getting Nmap 6 to run on BackTrack 5 R2 is actually quite simple. Follow the steps below and prepare to bask in the newness of Nmap 6. Finally, these commands will compile and install Nmap 6. If you are unfamiliar with Linux, these are standard commands for installing software from source code. Now, Nmap 6 is installed. Check out the announcement here, http://nmap.org/6. You may also want to check out my previous post on Nmap NSE scripts, http://www.marshalgraham.com/2012/05/getting-started-with-nse-nmap-scripting.html. One thing to note regarding this installation method. During the first step, the BackTrack maintained Nmap package is removed. This means that apt-get will no longer be able to update Nmap. When a new Nmap version is released, you will need to repeat this procedure to upgrade to the current version. Edit: If you want to restore the BackTrack maintained Nmap, you can. Go back to the nmap-6.00 directory and run make uninstall. Next run apt-get -y install nmap to reinstall the packaged version of Nmap. After talking with some friends last week, I realized that the Nmap Scripting Engine (NSE) is an unappreciated and underutilized Nmap component. That is unfortunate, since NSE has easily become my favorite Nmap feature. According to the Nmap 6 release notes, the number of available NSE scripts is nearly 350! This seems like a good time for a long overdue blog post. This post talks about using the built in Nmap 5 scripts. It's intended to introduce NSE and assumes at least some Nmap exposure. If you are using Backtrack 5, the NSE scripts are located in /usr/local/share/nmap/scripts/. Each file ends with a .nse extension and is plain text. The scripts cover a variety of areas including vulnerabilities, information gathering, and exploitation. If you are uncertain of what a script does, simply open it in a text editor. Those are some pretty simple examples. Here is a little more complex one using smb-check-vulns. You can try running the unsafe checks with the command below. I have had limited luck with this, usually resulting in an SMB server crash (not good in a production environment!). This scan produced output from these scripts: broadcast-wpad-discover, targets-ipv6-multicast-slaac (are you sure you aren't running IPv6? ), broadcast-ping, and broadcast-netbios-master-browser. Broadcast-wpad-discover only returned that it could not discover a WPAD DNS or DHCP entry. To get an idea of what broadcast checks are performed, check the broadcast scripts in /usr/local/share/nmap/scripts/ (ls /usr/local/share/nmap/scripts/broadcast*). Here's a sampling of things I have discovered using the broadcast category: Dropbox clients, shared iTunes libraries, TiVo beacons, mDNS/Avahi/Bonjour services, MS SQL servers, UPnP capable hosts, Netbios hosts, and proxy servers (via WPAD discovery). The TiVo actually discloses the TiVo Service Number (sort of like a serial number). It seems like each time I run this script, I find a new service. While writing this article, I learned from the broadcast-upnp-info script that the Roku runs an embedded web server on TCP port 8060! However, I think the real power of the broadcast scripts is the ability to enumerate network hosts and services in virtual silence, never requiring a direction connection to the discovered host or service. I hope you enjoyed this intro to NSE scripts. Thanks for reading!